ABOVE: The sommelier prepares to serve a bottle of wine at lunch. INSET BELOW: The Savoy Restaurant, the omelette station at breakfast, lunchtime sweets, a main course at dinner, and an evening dessert. The main dining room on River Countess is the Savoy Restaurant on Marco Polo Deck (the ship's main deck), aft and down a hallway of cabins from Reception. The restaurant has an "open seating" policy, and guests can dine alone, à deux, or at larger tables with other passengers. On the first night of our cruise, we shared a table with two women who were traveling together, and we ended up dining with them every night but one. Early-morning coffee and pastries are available in the Patio Lounge from 6 to 7 a.m., and late sleepers can enjoy a late breakfast in the main Castillo Lounge from 9 to 10 a.m.
On days when most guests are aboard, you can get excellent lunchtime pizza by the slice, salads, prosciutto, and desserts in the glassed-walled Osteria Siena on the Sun Deck. Dinner is served by waiters in the main restaurant, with a different four-course menu each night. Main courses normally include several Venetian- or Italian-inspired dishes and at least one vegetarian option. Main-course photo: Whole-roasted beef tenderloin with jumbo shrimp, cauliflower, mashed potatoes, asparagus tips, crimini mushrooms, vegetable parisienne, and local baby tomatoes confits with béarnaise sauce. If you aren't tempted by the day's menu, you can ask for steak, salmon, or chicken breast with a choice of side dishes. Dinnertime desserts on River Countess are as beautiful as they are tasty, and choosing just one can be a challenge. Dessert photo at right:Valrhona warm molten chocolate cake with homemade red berry sorbet. If you prefer cheese to sweets--or if you want both--you can end your meal with a selection of three Italian cheeses. Tea time is from 4 to 5 p.m., with sandwiches and pastries plus tea, coffee, or drinks from the bar. The main Castillo Lounge on Marco Polo Deck is a large room with panoramic windows, upholstered chairs, tables, and a bar. As you enter the lounge, you'll pass a serving counter that offers a late breakfast, Uniworld's signature candies and marshmallows, teatime tidbits, etc., depending on the time of day. Bar and mealtime drinks are included in the fare, except for a few "premium spirits." We suggest trying a Spritz--shown at right--which is a popular Venetian drink made with Prosecco sparkling wine, a dash of Aperol liqueur, and soda water. In the evening, a staff musician entertains passengers in the Castillo Lounge. One night during the cruise, local entertainers come on board for an after-dinner show. The Captain's Lounge and Library is a small, quiet room just behind the Castillo Lounge on the starboard side of the ship. In addition to books and magazines, it has printed copies of daily mini-newspapers that the ship downloads from a news service. One flight down, on Bellini Deck, you'll find the small Patio Lounge with its 24-hour coffee, tea, hot-chocolate, and cookie station. 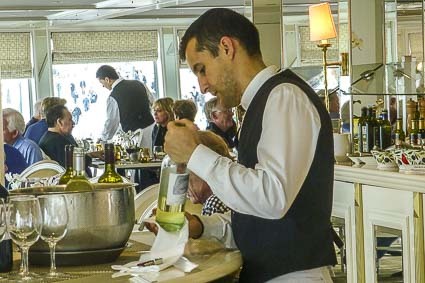 Finally, the glass-enclosed Osteria Siena on the Sun Deck becomes the Sky Lounge when lunch isn't being served. It's a pleasant place to sit, chat, or read away from the crowd.